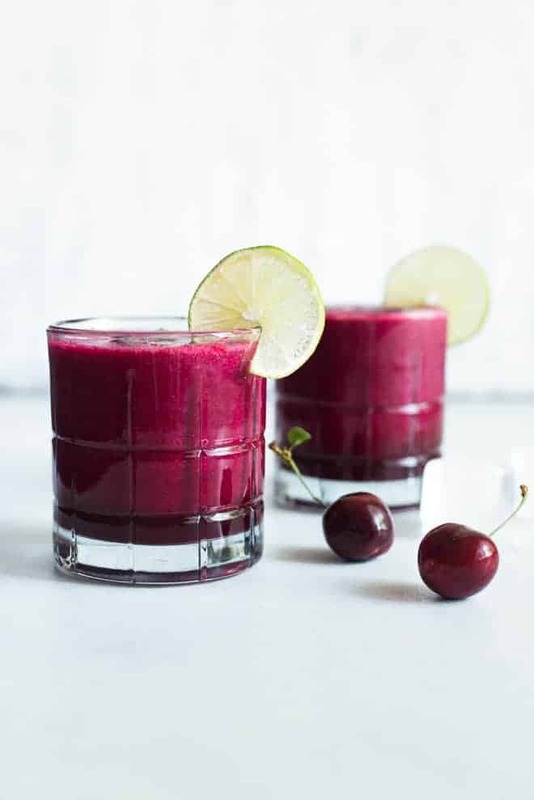 This cherry lime red beet smoothie is the perfect drink for summertime. It is refreshing and the red beets give the smoothie a beautiful color! Cherries are my summer candy. I love sitting around on a lazy summer day, stuffing my face with fresh cherries, and spitting out the pits like a baseball player with sunflower seeds. However, as we all know, cherry season is far too short. A few months a year just isn’t enough, but I guess this makes me appreciate cherries even more when they come in season! To savor cherry season for as long as I can, I like to buy pounds and pounds of cherries during peak season and freeze them. I usually use a cherry pitter to pit all these cherries, but this wine bottle and chopstick trick works just as well. (It’s a great excuse for drinking a bottle of wine, if you ever need one.) After pitting the cherries, I’ll line them all on a plate and freeze them for a few hours or overnight before transferring them to a freezer bag. This way, the cherries won’t clump up together in the freezer. At this point, you’re probably wondering why I don’t just go out and buy a bag of frozen cherries. Although frozen cherries taste fine, the color is definitely not the same. Frozen cherries tend to take on a more purplish hue while cherries that I freeze are still quite red, and they make my food look prettier. I’m a stickler for pretty food. 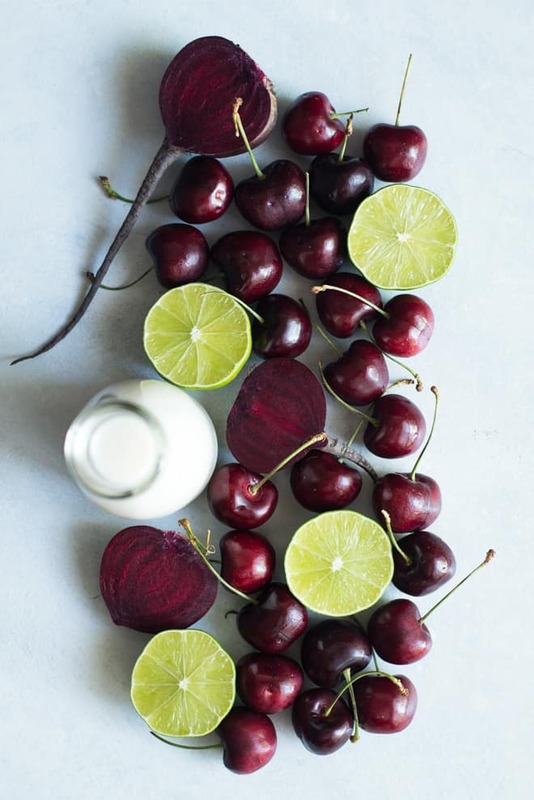 For this cherry smoothie, I added lime juice for zing and some beets to neutralize the sweetness of the cherries. The beets also give this smoothie a beautiful magenta color that just brings a smile on my face whenever I make it. Yeah, super cheesy but true! Let’s make a smoothie toast to the last days of summer! 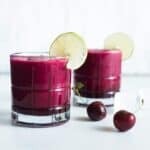 Turning this drink into a slushie: If you are still battling the summer heat, turn this smoothie into a super chilled drink to cool you off from the inside out! Try adding 3/4 cup of ice cubes to this recipe. 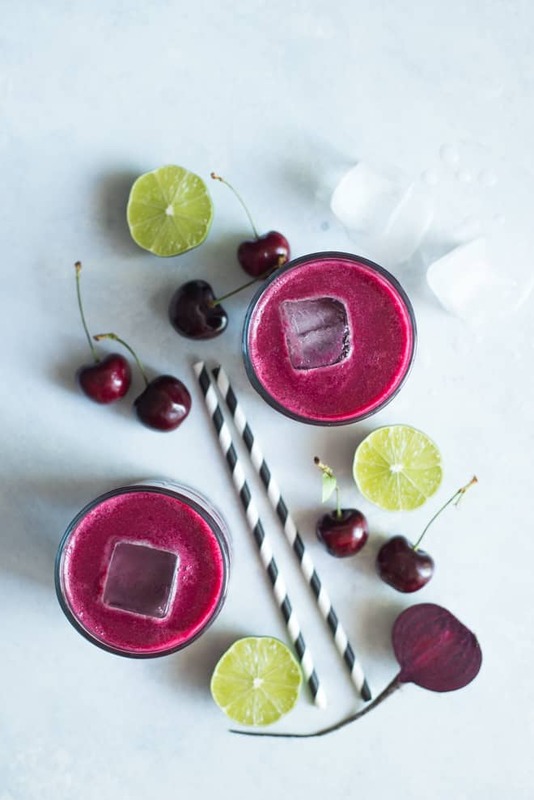 The ice cubes will water down your drink, so you might want to add more cherries, lime juice or beets to give the drink more flavor. Personally, slushies give me brain freezes, so I prefer drinking this as a smoothie instead. If you want something more sweet: Try adding 1/2 to 2/3 cup of frozen mango if you want more sweetness in the smoothie. I thought the mango made the smoothie a touch too sweet, which is why I left it out of the recipe. Blend all ingredients until smooth. Serve in glasses and garnish if a slice of lime if you like. Hi Lisa! This looks absolutely delicious! Adding the beets to cut the sweetness of the cherries is brilliant. I also think adding mango would be super yummy! Great recipe! I ran this through My Fitness Pal app and got different nutritional information. 450g of cherries has 78g of carbohydrates, which brings the nutritional information to: cal: 194, carbohydrate: 46.75, protein: 2.85, fat: 1.25, sugars: 27.40. I checked on the USDA site and got similar results. Perhaps you used the info on one serving of cherries (140g) and forgot to triple it. Otherwise, it looks like a great recipe and I’m going to try it. Hi Ann, thanks for your note! The program I use for the nutrition information wasn’t giving me the proper numbers. I will update them shortly. Thanks! Can cooked beets be used, do you think? They’re all I currently have. I’ve been making a smoothie everyday for my mother’s husband for a few months now. He was diagnosed with ALS early last year and has developed trouble swallowing. I’m trying to find different recipes. Right now I only have about 5 different kinds and would like to broaden the variety of ingredients. I never really thought of adding veggies other than leafy greens! It should work, Lynn! The flavor of cooked beets is a little more intense, but it should be fine in this recipe.